Since the launch of Destiny 2: Season of the Drifter, many players are thinking about Sentry Synth. Most of them don’t know what is a Sentry Synth basically and how can you acquire one. Even if some players have one, they don’t know the full potential of it. In this article, we will tell you how you can get it and what can you with it in Destiny 2. Some of you might already know about Sentry Synth. 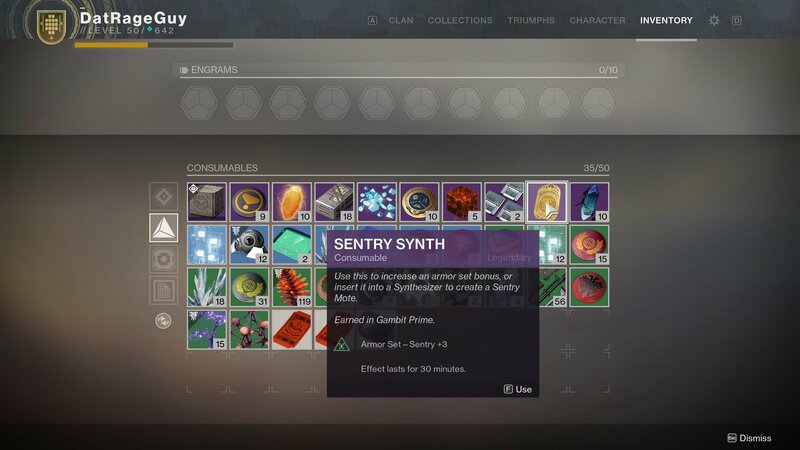 For those who don’t, Sentry Synth is one of the four synth types that you can obtain in Destiny 2: Season of Drifter. The synth is used to unlock Gambit Prime armor set and every synth is important as each of them plays a unique role in finding the armor pieces. Sentry synth can be acquired by playing special game modes like Gambit Prime or The Reckoning. After completing each match of The Reckoning, you get a random drop. That drop may contain Sentry synth. On the other hand, it can also be obtained by completing Gambit Prime challenges. Whenever you complete any challenge, you’ll get a shot at finding Sentry synth. Once you have found the item, you are going to need Weak Synthesizer to activate the piece. When you this, a mote will be crafted. That mote is used to activate The Reckoning mode. Don’t forget that Sentry synth plays an important role in acquiring the gear like Gambit Prime armor set. Try to get a maximum number of Sentry synth in the game. Your chances at getting desirable pieces of gear depends upon how many Sentry synth you hold in the inventory. Again, there are four types of synth in Destiny 2: Season of the Drifter and Sentry synth is one of them. You can get the Sentry synth by playing The Reckoning mode and also by completing gambit Prime bounties. After acquiring the Sentry synth, it can be used to activate the Reckoning with the help of Weak Synthesizer. How many Sentry synth do you have in your inventory? Tell us in the comments section below. Also, don’t forget to read our guides below. It will help you enabling “The Reckoning”.